Over the last couple of years, grey has been trending very strongly in all areas of homes, from living rooms, to kitchens, to bathrooms. In fact, the timing of its spiralling popularity seems to have matched the recent emergence of a somewhat provocative book whose title refers to the fifty hues of the same colour. Just like Anastasia in the book, it seems that homeowners have become obsessed with Grey, and this obsession shows little sign of burning out. So just what is behind the magnetism that charms us into adorning our homes with grey? The colour grey, just like the book’s protagonist, is enchantingly seductive. Why do you think E.L. James chose that as his name? As we can see in the below scene, there’s an understated allure to this colour, which is subtly portrayed through the enticing hues of the wall tiles and the wood-effect floor tiling. And is there any colour more elegant than grey? Its capacity to deliver countless hues and shades (I believe there are fifty!) which complement and dance off each other, under both lighting and shading, embodies grey’s minimalist elegance. This is exemplified by our Stockholm floor and wall tiles shown below. The combination of strong grey and warm white tones will bring a cool, sleek look to any bathroom. Anyone who has read the book knows just how, ahem, versatile Grey can be. Again, this can be attributed to its inexhaustible number of tones – from hard gunmetal grey to softer blue greys to deeper warmer brownish greys. Such versatility makes grey an incredibly adaptable colour suitable to all spaces within the home. Just like our protagonist, and as Anastasia discovered, you can never be quite certain of consistency with grey. In terms of the tones it exudes, grey can be rather chameleonic – almost changing to match the surrounding colours in its environment. This further adds to its intrigue. Consider, for example, our appropriately named Temptation floor tiles displayed below. 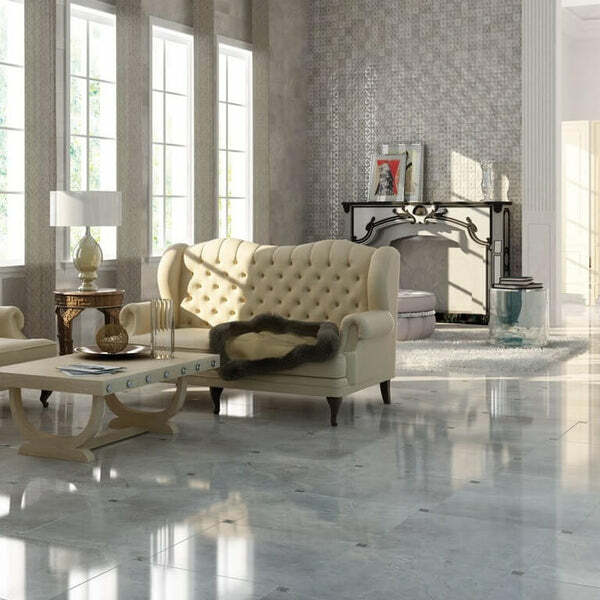 Depending on the accessories with which you pair these gorgeous marble-effect tiles, the floor tiles will appear to radiate different hues. Today it’s cool grey, tomorrow a soft brown. In autumn it is charcoal. Remind you of anybody? The intricate webs of veining in this flawless salute to Spanish Emperador marble add to the mystique by further accentuating the tonal variations. You’ll never cease to be drawn to its changing faces. A further way in which to lure out the changing tones of grey is through the use of appealing accessories, such as natural wood fixtures or furniture, bright or neutral towelling, copper fittings, delightful décor, or charming vases. Experimentation can stimulate a new grey every day! Because it comes in fifty shades, grey easily complements almost any colour. Note how our alluring Blendstone floor tiles below simultaneously bring out the best in the dark interior shades and the white accent sofa. Grey effortlessly permits this mixing of light and dark shades, which generates a thoroughly modern design statement. The grey texture in this extra-large stone effect tile has been achieved by mixing the different tones and patterns found in sandstone. However, grey not only complements bold contrasting shades, but also pairs with neutral browns and beiges, as evidenced by our highly polished and irresistible Tiffany floor tiles below. One of the principal reasons grey is at the forefront of current interior design is because it is confident enough to linger mysteriously in the background (reminiscent of anyone?) while eliciting other statement features to come to the fore. Grey will entice your favourite accessories to step forward and stand out. It’s particularly effective as a backdrop in Victorian and other old-style homes, as it accentuates traditional features in rooms without imposing on them. Note how our above Tiffany floor tiles, inspired by luxurious Carrara marble, provide a dramatic backdrop for the significant encounter space in the drawing room. 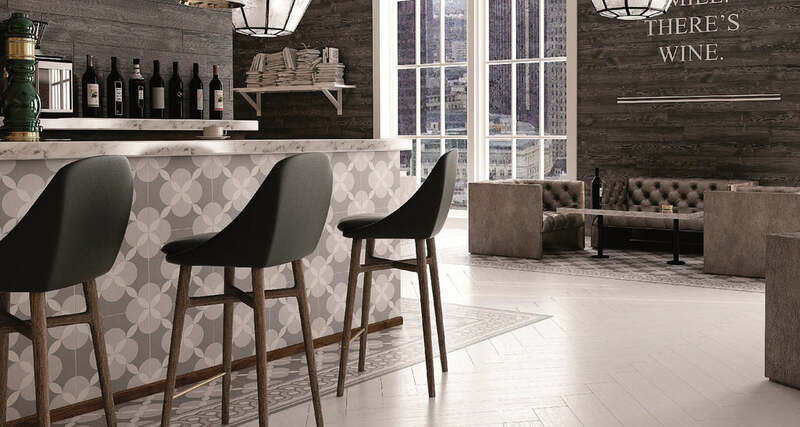 Premium grey tiles such as these will enhance any of your design ideas, whether in living areas, kitchens or bathrooms. And your statement design will be further enriched with our matching Tiffany Wall Tile. And just as Christian Grey enlightened Anastasia on certain shadier aspects of society, grey can provide the desired solution for dark or shady rooms. Bathrooms in particular tend to be starved of natural light, and in many cases homeowners opt for brilliant white or other bright colours to make the space as bright as possible. But this often generates a cold, sterile feel. In such situations, grey can act as a saviour. A new interior design approach to dark rooms is, rather than introducing bright colours, to embrace dark colours to create a warm, homely feel in the room. And among the darker shades, grey is the most desirable as it's the perfect softener, beautifully reflecting available light while enhancing warmth. As slate evokes aquatic images of waves rolling in on rocks, grey slate-effect tiles are often the ideal go-to tile to introduce soft warm light into dark bathrooms, as evidenced by our alluring, creamy grey Stone Effect Tile below. Rather it is understated, seductive, charming, elegant, versatile, enticing, affirming, complementary, confident, and enlightening. Wow, what a colour!! So dive into grey this year and liberate your interior design fantasies.